The Story behind the Propane Tank Swap Scam | St. Peters Hardware & Rental Inc.
Share "The Story behind the Propane Tank Swap Scam"
What is the tank Swap Scam? There are supermarkets, gas stations, convenience stores, drug stores that have cages with pre-filled propane tanks out front. The first part of the scam is that you give them your tank and they give you someone else’s tank. You could end up with a tank that is much older than the one you gave them. Imagine giving them your brand new tank and getting back one that is 10 years old nearing its expiration date! The second part of the scam is that they are charging you a lot more for the convenience of exchanging a tank and they hide this extra charge because they count on you not noticing that they are not filling your tank. By the way, did you know we can properly and fully refill your tank in about 5 minutes and even on our busiest days there is never a long wait? They quietly tell you that they only partially fill the tank by having a small sign on their cages that says “net weight 15 pounds” and by putting a label on the tank that says “Net Weight 15lbs.” That is fine, EXCEPT YOU HAVE A 20 POUND TANK! This is like buying a can of soda and getting only 9 ounce instead of the 12 ounces the can is made to hold or buying a gallon of milk and finding it is only ¾ full. Of course! You cannot see into a propane tank and when you get your tank filled there is some trust involved. The fact is, if you get a tank from a tank swap place you would probably assume it was a 20 pound tank never realizing you had been short changed. St. Peters Hardware and True Value Rental is a locally owned family business that has been around for 70 years in Alton and 17 years in Edwardsville by caring for our customers. It is not in our best interest to short change a customer by under filling their tanks. You can continue to trust us to properly and completely fill your tank. Don’t let their tank swap scam fool you. 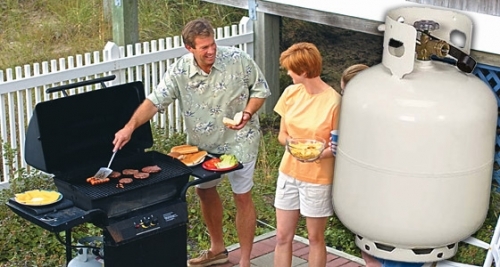 We are and will continue to be the best way to have your propane tank re-filled!